Views From The Kitchen | Part photo gallery. Part travelogue. Part diary. I visited the Benmore Botanic Garden at this time last year. It’s one of the regional gardens belonging to Royal Botanic Garden in Edinburgh and is located about seven miles north of Dunoon. My friend Carol often visits the Edinburgh garden and suggested that we visit Benmore to get some photos of the autumn colours. After spending the early part of the afternoon wandering around, we decided to head back towards the entrance to try to catch the setting sun in a particular area we’d passed earlier. Given the hilly nature of the surroundings, the sun disappears from the sky behind the neighbouring hills well before sunset, leaving many areas in shade. We were passing the pond and stopped to take some shots. 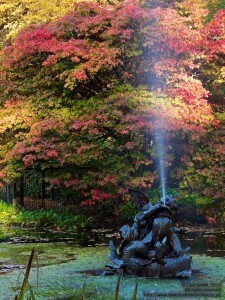 This one shows the fountain against some sun-dappled autumnal foliage. (I’m afraid I’m not particularly botanically inclined, so you’ll just have to make up fancy tree names yourself.) The bronze fountain is in the form of a boy with two dolphins and dates back to 1875. I went to Queen’s Park and walked up to the top of the park. For those who don’t know the park, it surrounds a hill on top of which is a flagpole. 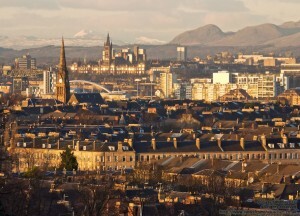 There’s a paved viewing area around the flagpole and, on good days, you can enjoy extensive views over much of Glasgow. This was a bright, wintery day, so conditions were ideal. I’ve got a new camera – the new Lumix DMC-G1, from Panasonic. I bought the body with the standard kit lens and also got the long zoom lens at the same time. The kit lens is the Lumix G Vario 14-45mm/F3.5-5.6 ASPH./Mega O.I.S. and the long zoom is the Lumix G Vario 45-200mm/F4.0-5.6/Mega O.I.S. model. The kit lens focal length range of 14-45 corresponds to 28-90 in 35mm terms and the long zoom has a 35mm equivalent of 90-400mm. This article isn’t going to be your typical camera review and I’m not going to simply quote specifications. If you want something more structured and formal, please go and read the two reviews that I read before taking the plunge – they’re over at Luminous Landscape and Digital Photography Review. Instead, what I’ve aimed to provide here are the initial observations and reactions of a new owner of a G1. Posted in Photographs, PowerShot G9, Scotland	| Tagged cold, frosty, Glasgow, landscape, mist, park, Pollok House, Pollok Park, river, trees, twilight, White Cart	| Comments Off on Tree, Twilight, Mist. 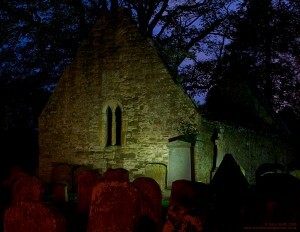 I visited the scene a shade over two years ago and got the following atmospheric shot as dusk fell. While the council had seen fit to install some external lighting, there was no sign of the warlocks and witches in a dance witnessed by Tam… Still, I did manage to get this spooky photo of the ruined church. This is from my May short break last year. I’d spent the last 90 minutes or so about three miles back along the road, pottering about at Loch Nan Uamh. The sun was setting and the light had been pretty good. However, all good things must end and I had to be back at the hotel (the Lochailort Inn) by 8pm to order my evening meal before the kitchen closed. I cut it close leaving Loch Nan Uamh, wanting to maximise my shooting time. As I drove towards the hotel, I could see that the clouds in the sky ahead of me were pretty dark. 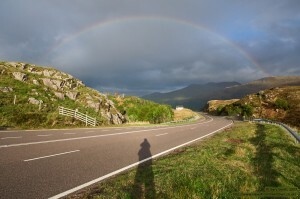 With the sun setting behind me and rain coming from in front I was suddenly presented with this marvellous rainbow. Dilemma! Do I risk missing dinner and stop and grab a shot of it (in the rain which had reached me by then) or just drive on? Okay – so that was easily answered! 🙂 But just a quick handheld shot – no tripod. The road was quiet, so I managed to stop easily. I grabbed the camera out the bag and, shielding it from the rain with my body, ran across the road. One quick test shot and then this one. Then back into the car and on my way. I am definitely going to try harder this time – honest! After several months of apparent inactivity in the kitchen, I have finally upgraded the site with my new theme (design). Yay! 😀 Expect new posts to appear a little more regularly. For those of you who would not be appreciative of the technical details, it mainly means that I can now post larger images. The first example of this is the Craignethan Castle post.